When Apple CEO Tim Cook finally verified the existence of the next iPhone last week, I decided to take a little overnight expedition. Yes, it’s another trip down the tech rabbit hole, and it began exactly at 3:00am, EDT this past Friday. The very moment the new iPhone 6 was supposed to become available for preorders online. Am I a crazy devotee who waits on line for hours or days to be one of the first to own the next Apple device? Had I somehow leapfrogged ahead in my tech-ownership rules of engagement and become a cool early adopter? No, I still stand by my standard position to let everyone else work all the kinks out of a new tech product. Had some smarter life force taken over my brain to simplify my life? It would free me from the need to methodically research whether the next iPhone was any good. And then I won’t be disappointed when the first batch of iPhones quickly sells out. And I won’t get all worked up when some of my friends claim to have simply walked into an empty AT&T or Verizon store and picked up their new iPhone like it was a loaf of bread. All this future heartache is avoidable if I just do the overnight Apple dance and have my shiny new iPhone shipped to my home. Truthfully though, who in his right mind really wants to get up at 3am to buy anything? So like the rest of you Apple die-hards, I’ve been struggling with the new ‘Plus’ choice. I really like the larger screen size of the iPhone 6 Plus, but the big question is will it fit into my trouser pocket?! Fortunately, after some quick Googling, I uncovered a useful ‘pre-order picker’ PDF that AppleInsider.com has posted online. 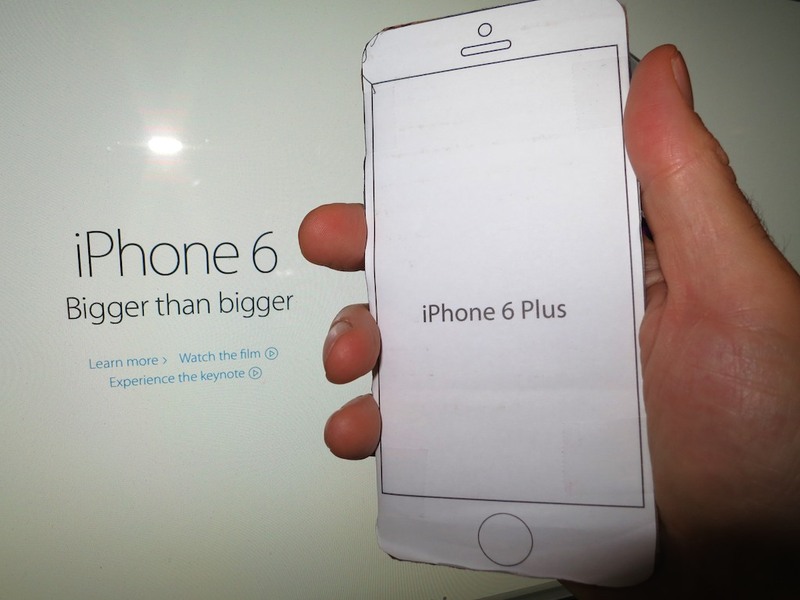 It’s a helpful, printable diagram with accurately sized outlines of an iPhone 6 and iPhone 6 Plus. My four year old watched this activity with great interest… Then, he immediately initiated his own project with the remaining iPhone 6 outline. I taped the pieces together and placed my new cardboard iPhone 6 Plus into my pocket. Will the iPhone 6 Plus Fit in Your Pocket? I carried the cardboard cutout around with me all day. I took out my paper clone every so often and held it in my hand. Then, I slid it back in to see if it would fall out of my pocket. Granted, my mock-up was a little thinner and lighter than the real deal, but it wasn’t a bad approximation. Occasionally, I was in the presence of other colleagues when going through my little exercise. If there were two or more people watching me, they’d glance at each other knowingly and roll their eyes. And after a short pause, everyone jumped at the opportunity. Because we were still a week away before anyone could test out a real one in an Apple Store. Everybody took a turn holding my cardboard iPhone 6 Plus. And then, all my new test subjects quickly had an opinion to share on its larger size. So maybe I’m not such a geek after all. My informal work survey split about 50/50 on whether the iPhone ‘phablet’ was too big. But when I got home, I had my decision: I was confident the iPhone 6 Plus would fit into the many pockets of my life! I jump onto the online Apple Store. I immediately sense I’m on an endless line. This continues for the next hour and five minutes. 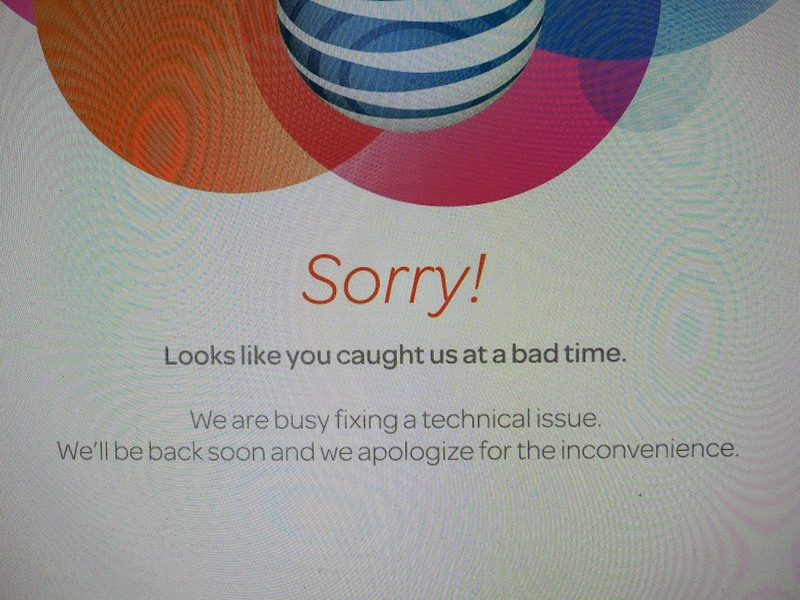 I decide to check out AT&T’s website. 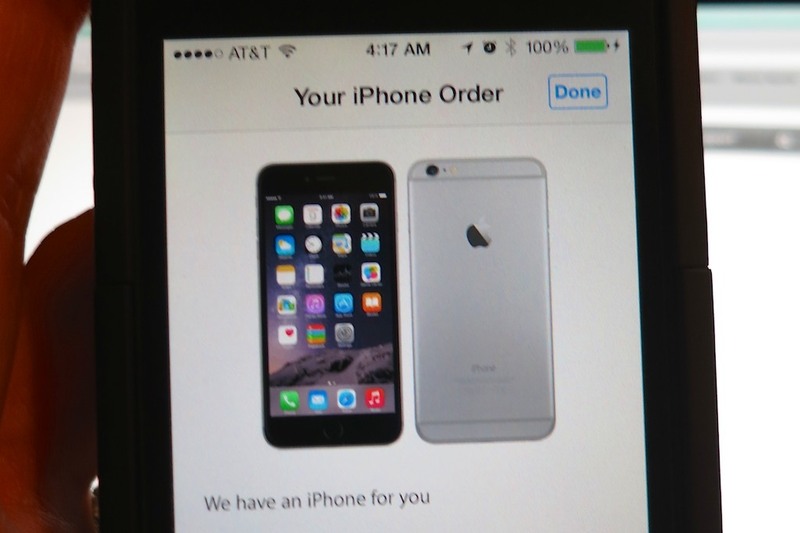 Yep, it’s selling the iPhone 6, but the small print talks about 14-21 business day shipping. 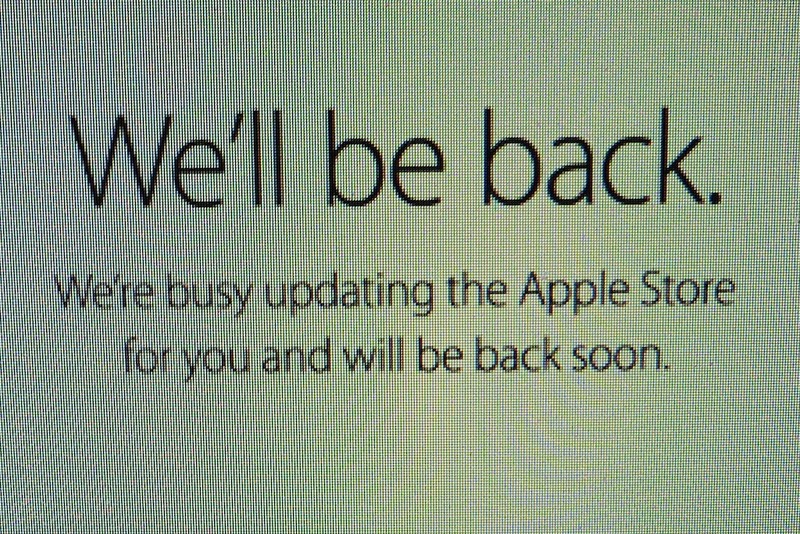 As I ponder the delay, the website crashes (3:44am) and then reboots a few minutes later with “coming soon” next to Apple iPhone 6 and iPhone 6 Plus. I come across a suggestion on CNET to try the Apple Store IOS app. (It was reportedly standing up better to the online stampede of iPhone buyers. So I give the app a whirl on my 4S. But on the second attempt, I’m in! Peppy music starts playing in my head as I whisk through each order screen. No, the app doesn’t freeze, but the final ‘Order’ button is grayed out. …but the order can’t be completed…. …because the Apple servers can’t reach the AT&T servers to confirm my details. I would receive an email link to complete my order, and I would have to respond to the link within 24 hours or lose my place in line. 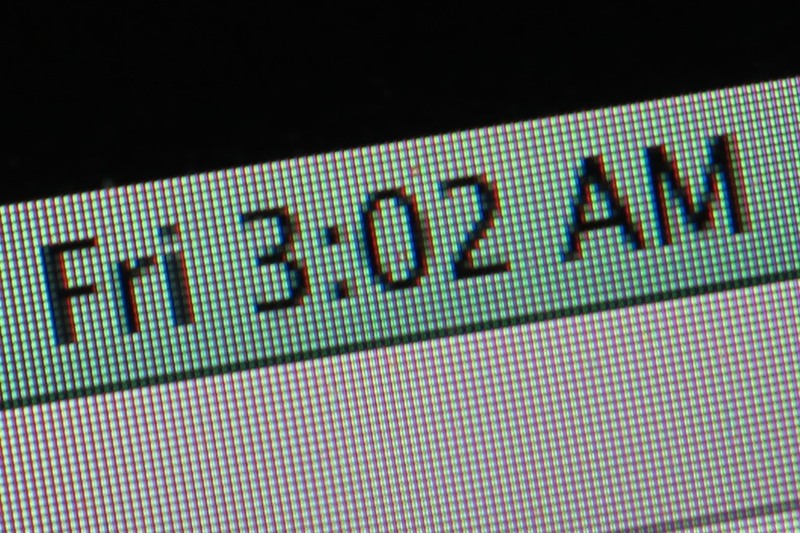 By now, it’s almost 4:30am. I don’t know whether I should feel satisfied or not. When I wake up, I take a look at my inbox and see a confirming Apple email with my reservation number. 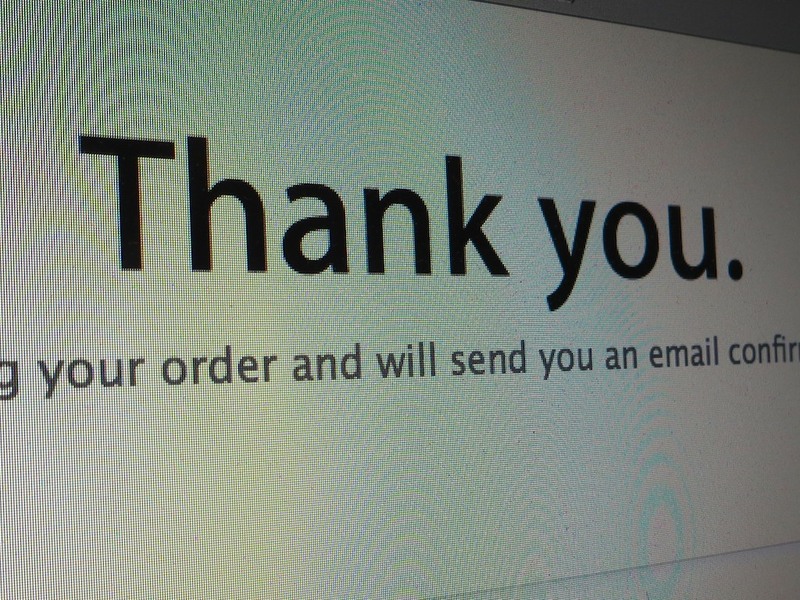 I guess the real question now is whether I will receive my iPhone in the first wave of happy recipients, who were lucky enough to complete their order in the first minutes of the release. 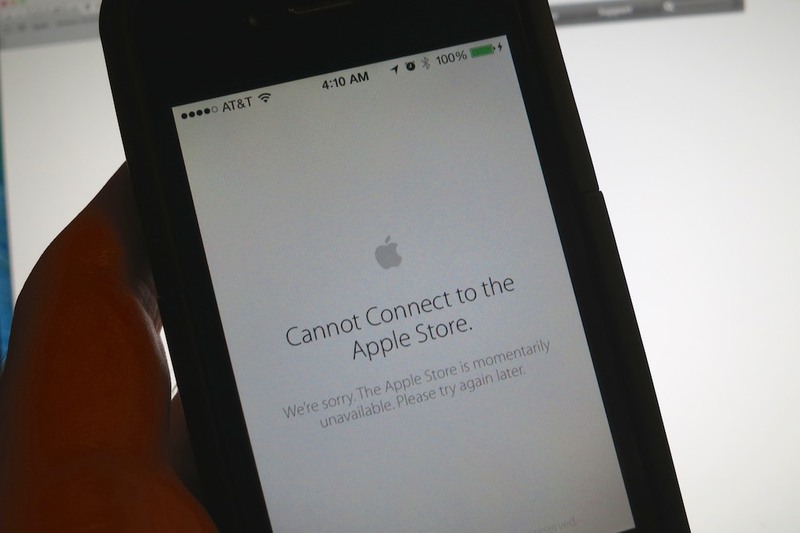 Next, I go to see if the online Apple Store is still down. No… in fact, it’s chugging away… just like any other day. And in less than 60 seconds, I‘m where I had hoped to be at 3:02am. The shipping date has already slipped to 3-4 weeks. I go to work the next morning pondering the intelligence of my entire plan. The email comes in with the link to complete my purchase. My heart rate elevates as I quickly navigate to the finish line. Well, that’s doesn’t put the iPhone in my hands on the first day it hits retail Apple Stores, but it’s close. And more importantly… I’m done! Yes, there’s still the little detail of receiving and activating my new iPhone 6 Plus. But let’s assume that goes smoothly. No, I wouldn’t consider my iPhone purchasing experience especially quick or smooth. On the other hand, yes, I successfully bought my iPhone on day one. And all my waiting did occur in the comfort of my own home. pre-orders for the iPhone 6 Plus are having ever growing shipping delays. I guess all my effort paid off after all. Soon, I will be at home with my new iPhone. Now, it’s time to catch up on some sleep…!